Life is governed by rhythms—the behaviour of animals strongly depends on the time of the day, and a shift of this rhythm can cause serious perturbations as every intercontinental traveller suffering from jet-lag can confirm. But also in the realm of cells, life is rhythmic and composed of repeated activities, such as cell cycles and mitotic divisions. Rhythmic activities are also often used to structure space—most fundamentally seen in the subdivision of numerous organisms into individual cells, but also on higher levels of organisation, for instance, as segmentation of body plans, or as patterns of differentiated cells in a tissue. A rhythm, once established, continues with a certain inertia and is sustained by self-activating processes that suppress deviating activities by lateral inhibition, a principle that has been recognised by the British mathematician Alan Turing (1952) as one of the central rules acting in living organisms. But how is a biological rhythm shifted, or even newly initiated? Two contributions to the current issue try to address this variation of the chicken-egg problem in two different systems and follow, how external physical cues can be used to project activity into geometry and, thus, to structure space. Circadian rhythms are well known from animals including Homo sapiens. Although less evident, because usually not manifest as movement, they are also found in plants, for instance, in growth, flower opening, or nectar production. A prominent example is given by the so-called nyctinastic movements in leaflets of several Fabaceae that can close and open along a preformed path in a circadian rhythm. Swelling of special flexor cells leads to closure of the leaflets, while swelling of the extensor cells at the opposite site will open the leaflets. In both cases, the swelling response is brought about by potassium influx followed by osmotic water uptake; just the timing is shifted following a circadian rhythm. The opening of potassium influx channels is the consequence of a preceding acidification of the apoplast through proton pumps. These ion fluxes can be modulated by pharmacological modulation of calcium in the apoplast. Furthermore, a pulse of red light administered at the time prior to the endogenous closure can hasten this response, and the effect of red light can be quenched by a subsequent irradiation with far-red light. This photoreversibility is indicative of phytochrome as photoreceptor that can shift the rhythm. In their contribution to the current issue, Moysset et al. (2019) dissect the link between light as physical factor and calcium as signal transducing the light effect upon the flexor-extensor machinery, which in turn drives the nyctinastic movement. 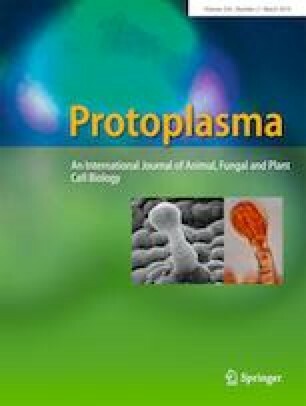 They visualised the subcellular localisation of calcium using potassium pyroantimonate precipitation in combination with TEM and X-ray microanalysis in the model Robinia pseudoacacia. While calcium was detected in all relevant tissues, independently of the light treatment, the authors observed that in response to red light, calcium accumulated in the cytoplasm of extensor cells preceding the leaflet closure. This effect was not seen for far-red light that does not activate phytochrome. The source of this phytochrome-dependent calcium accumulation has still to be clarified. Classical work (Hollins and Jaffe 1997) had led to the notion that specific tannin vacuoles found in leaflets that are able of nyctinastic or seismonastic movements act as calcium stores. However, in more recent findings, where leaf motility was not correlated with the presence of such tannin vacuoles, (Fleurat-Lessard et al. 2016) have cast doubt upon this concept. The most straightforward model would therefore assume that phytochrome, by opening calcium influx-channels in the plasma membrane, is able to set the rhythm of nyctinastic movement. Also, the contribution by Asada (2019) in the current issue asks the question, how a rhythmic process—the geometry of cell division—can be established de novo. The axis and orientation of the ensuing cell wall are predicted by a particular microtubule structure appearing at the transition between G2 and M-phase in cells of terrestrial plants. This so-called preprophase band (PPB), although ephemeric in existence, can guide the geometry, in which the new cross wall will be laid down. Since plant tissues are under considerable tension, due to the turgor pressure of the expanding protoplast upon a constraining cell wall, the orientation of the cell wall has to match the stress-strain patterns in the tissue. In other words, plant morphogenesis follows a biophysical, rather than a merely biochemical script (for review, see Lintilhac 2014). This biophysical script is reiterated each time, when a new cell is added to the tissue. But how is it set up de novo? This cannot be studied in the context of a tissue, obviously. By digestion of the cell wall and subsequently allowing regeneration of a new cell wall in these protoplasts, the author can create a situation, where no external physical cues can distort the spontaneous alignment of a preprophase band. To visualise this microtubular structure, a cell line was used expressing a GFP fusion of a plant β-tubulin. In most cases, the cells divide symmetrically, and the cross wall is oriented perpendicular with the long axis of the cell. This division geometry has been observed repeatedly, but only rarely the question was asked, how such a holistic pattern (symmetry, alignment with the short cell axis) can be set up by a biochemical (and therefore scalar) process, such as microtubule nucleation. The author sets forth to test a geometry-based hypothesis termed reach model suggesting that the PPB is produced at the cell wall closest to the nucleus (which in vacuolated plant cells moves to the cell centre during G2). This model would predict that PPB positioning should differ, when the cells are asymmetric in shape. Using a combination of shape descriptors and rigorous quantification, he can show that division site and orientation can be well explained by the reach model, and that deviations from the common pattern, for instance, deviations of the PPB from the short cell axis, can be predicted by the reach model from shape asymmetries in the mother cell. In other words, rather than to rely upon the obvious, but somewhat metaphysic notion that the cell needs to sense holistic properties such as symmetry or axis, when it comes to lay down the PPB, the reach model can derive PPB orientation based on local constraints (distance between nuclear envelope and cell wall). The preference for the closest site might be of mechanic nature—microtubules are rigid structures that are able to convey compression forces (Gittes et al. 1993; Koch et al. 2017) and undergo dynamic decay upon pressure (Akhmanova and Steinmetz, 2008). In both cases described here, a physical cue (light, mechanic force) is used to entrain (in case of nyctinasty) or even to establish (in case of PPB organisation) a process that will subsequently self-perpetuate as rhythmic activity. The ease by which these self-organisation phenomena emerge is astonishing. However, in both cases, there exist self-amplifying loops (the self-referring circuit of ion transport in case of nyctinasty, the self-referring circuit of microtubules and compression forces in case of PPB formation), and in both cases, the respective molecules, in this case calcium ions or tubulin heterodimers, are limited leading to mutual competition. Therefore, both systems meet the criteria of a Turing system and therefore tend to be rhythmic by themselves. Rhythmic behaviour might therefore be something like the default activity of life.